MAC is a non-tuberculosis mycobacterium (NTM). It is found everywhere in the environment, and since the 1990s has been increasingly found in people with Cystic Fibrosis. 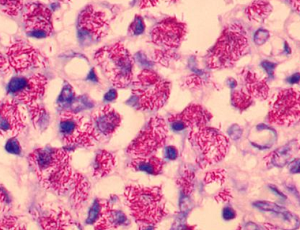 A study was published this month in the Annals of the American Thoracic Society (ATS) that looked at the differences between relapse of infection and a reinfection of the lungs by Mycobacterium avium complex (MAC). The study was not done with CF patients, however, the findings may be worthy of note because it suggests that routine use of pulsed-field gel electrophoresis (PFGE) could be useful in managing recurrences of MAC. In order to determine if the MAC infection was regrowth of pre-existing bacteria (relapse) or a reinfection, the bacteria in the sputum was genotyped using pulsed-field gel electrophoresis (PFGE). Patients with a relapse of MAC presented, or got sick again, earlier than those with reinfection, and were more likely to have increasing macrolide MICs–need more macrolide antibiotic to inhibit the MAC growth. MAC is a non-tuberculosis mycobacterium (NTM). It is found everywhere in the environment, and since the 1990s has been increasingly found in people with CF, as well as middle-aged women with bronchiectasis and older men who smoke and have upper-lobe lung disease. At the 2013 European Cystic Fibrosis Conference, NTMs, including MAC and Mycobacterium abscessus complex, were sited as the most important emerging threat to CF patients. Generally there has been a tendency towards higher prevalence rates being reported over time with a median prevalence rate of 9% (IQR: 3 – 11%) …. The reasons for this possible rise in NTM prevalence remain unknown, but could include changes in surveillance strategies although many centers are adamant that is not the case. Other reasons could include greater exposure , changes in the lung flora due to inhaled antibiotics , and reduced host immunity through autophagy inhibition during azithromycin treatment  or patient-to-patient transmission . Although the NTMs are found across all ages, Mycobacterium abscessus is more likely to be found in children with CF, and MAC is more likely to be found in adults with CF. Written by: Melissa75 on September 27, 2016.